Success at last! 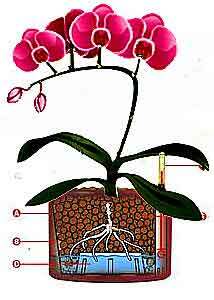 Growing orchids easy with our simple to use hydroponic system. Great for beginners and experts alike. You'll be amazed at the beautiful hydroponic orchids you can grow! I've been growing hydroponic plants and trees for over 25 years with this system. 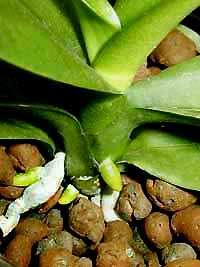 Several years ago I discovered that it was the perfect sysytem for growing hydroponic orchids. Pebbles Replaces other media. Cleanier, easier to use. Less root decay. Gauge Tells you when to water Eliminates overwatering. Pot Designed for maximum air flow at the roots. Nutrition Plants get everything they need for strong healthy growth. No fertilizer runoff or buildup. LECA (Lightweight Expanded Clay Aggregate). LECA pebbles provide the ideal mix of air and moisture to the roots. 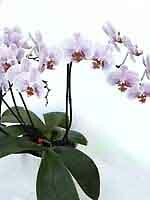 Both you and your orchids will like the clean, healthy environment without decomposing bark, mold, or bacteria. No more guessing about watering! Is the plant too wet ... or too dry? What holds water - what doesn't? Our Water Gauge tells you when to water. A Decoratve outer pot holds the water and the LECA pebbles pull up nutrient solution to the plant safely and evenly. At the same time the openings in the inner pot promote maximum air circulation at the roots. Imagine, no more trips to the sink for soaking and no more worries about water on the floor! What nutrients are your plants are actually getting? Complete, balanced nutrition is easy with our system. No more guessing. Just add a few drops of nutrients to the water and your plants will get everything they need for healthy growth and vibrant blooms. No worry about salt buildup either. Just flush the roots at the sink every couple of months and all the impurities wash away! With our system your orchids will practically take care of themselves. Imagine your orchids in a single media that's clean, easy to use, and won't breakdown. Spend less time on your plants and get better results! Healthy plants are easy with correct watering and balanced nutrition. Fewer insect problems - and other plant ailments too! Beginner or expert, your orchids will benefit from our system! Our "Starter Set" has everything you'll need to transfer two orchids to Hydroponics. Step by step instructions included. and grow Hydroponics Orchids today!